The Designer Studio is the high-productivity portal for application designers. 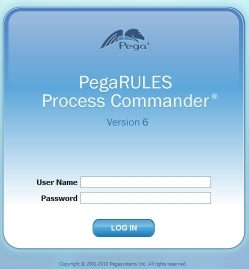 PegaRULES Process Commander 6.1 introduced an innovative, high-productivity portal for application designers known as the Designer Studio. The Designer Studio provides quick access to dozens of tools and wizards. Features include, the Pega button ( ) menu, which provides quick access to 50+gadgets grouped into landing pages. Many of these landing pages and certain wizards provide holistic reporting and management at the application level, as opposed to the more granular RuleSet or RuleSet Version level. In addition to the Pega button menu, enhancements to the tab bars provide quick access to all objects and easier navigation. Other features include a What's Happening display where designers can monitor each other's work and progress in near-real-time even when physically distributed. Updates to features include a full-text search that retrieves matching rules, data instances and help topics. The prominent Pega button ( ) menu provides quick access to more than 50+ gadgets grouped into landing pages. Click the Pega button to access the menu categories of landing pages. Menu categories are as follows: Application, Process & Rules, Data Model, Integration, Org & Security, and System. 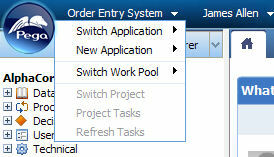 Note that menu categories may vary according to your position and any solution frameworks you have installed. Landing page categories are divided into submenus and are listed below each appropriate menu category. To review the organization of the landing pages (and see all available gadgets), click the Pega button and then click the Show All button. Each gadget provides information; most allow easier configuration of specific capabilities in your system or your application. 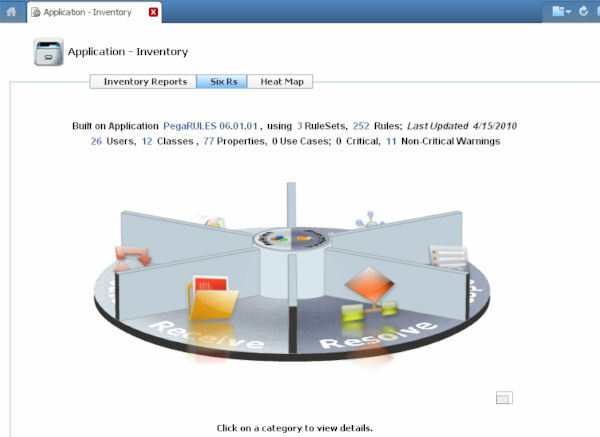 The Application – Inventory landing page has three associated gadgets providing information about the currently open application: Inventory Reports, Six Rs (shown), and a Heat Map display. 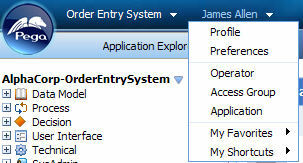 The toolbar reflects options and functions available for the currently selected rule form, data form, or Explorer list. The header bar (below), at the top of the Designer Studio window, provides access to the search facility, menus, and the Quick Launch bar. The tools and selection boxes on the header vary depending on your role, the type of workspace, and the contents of the form and list area. The Application Menu (below) identifies he current application. Click the down-arrow to access a multi-level menu of application-specific tools and information. The Profile menu (above) displays the Operator's full name. Click the down-arrow icon next to the operator name to access a menu of tools and information about this Operator, including Profile, Preferences, and Access Group information. The Quick Launch bar (above) provides icons for quick access to these tools and menus. Use the What's Happening display on the Designer Studio home page to track what is being modified and by whom. This information is also available while offline as a Really Simple Syndication (RSS) feed ( ). Messages pertaining to the current application are visible to other developers working on the same application. The display is limited to 25 messages with the most recent appearing at the top of the list. Periodically refresh the Designer Studio to see the most recent messages. You can also open recently checked-in rules from the What's Happening display. The Explorer area, a panel at the left of the Designer Studio, provides access to one of five tools. Only one tool is visible at a time. Each Explorer provides quick access to a subset of rules, data instances, and other instances in your system, in a tree structure that identifies them by name. Click a name to open the rule or other instance. Click the down-arrow at the right of the Explorer area to change to a different tool. Application Explorer — Rules belonging to RuleSet versions that belong to your current application, organized by category within work type. Class Explorer — Instances of all classes in your system, organized by the class hierarchy using directed inheritance. Rules Explorer — Rules and data instances in your system, organized by category and type. Project Explorer — Project tasks. 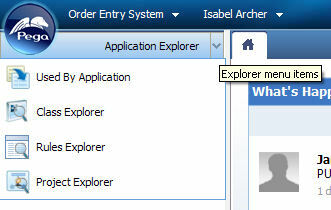 This Explorer is useful and available only if the Project Management Interface is enabled for your current application. Used by Application —Rules that are not part of your application but that are referenced by rules in your current application. Full-text search is enhanced to retrieve matching rules, data instances and help topics. You can search for keys of rules, or data keys, or search through all values in the entire object. Search may be restricted to rules in the current application. You can easily customize the log in and log off screens to match your corporate and application needs.